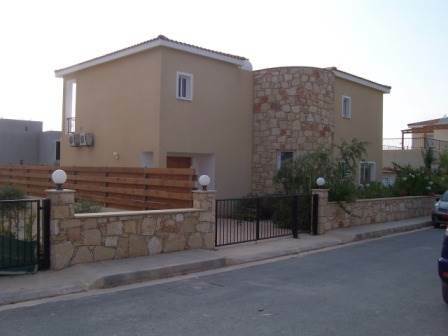 Cyprus Property Blog by Cleo : Fantastic Villa in Agios Georgios - Huge Price reduction! Agios Georgios, Paphos - Once you enter this home you will fall in love with the dramatic entry features and beautiful large double doors. The floor plan is completely open, with large rooms, corner fireplace and with great design, all the rooms flow together. Interior is tastefully designed in neutral colors. Huge kitchen features two double glass sliding doors leading to pool and side garden. All the rooms overlook an expansive outdoor entertaining patio with tropical garden, large swimming pool and outdoor BBQ. This home is immaculate and ready for you to enjoy all the special amenities in the sun. Agios Geogios is a wonderfull little fishing village with beach and tavernas sits on the west coast of Cyprus nestled next to the nature preserves of Akamas Peninsula and close to the popular sandy beach of Coral Bay .